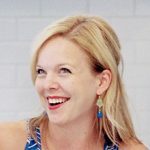 There are lots of foodies out there who inherited their love of food by being raised in a family of the same nature – lots of time spent in the kitchen together, family recipes passed down and all that. That was not my family. On my dad’s side in particular it was more of a permanent meat and carb combination, and never anything fancy. Despite this, I wouldn’t have it any other way. I still have a few foods that are steeped in memories. Apple juice, the drink I always requested the moment I arrived at my grandparents’ house. Ham, corn, and buttered egg noodles, the meal we always ate when that side of the family got together. 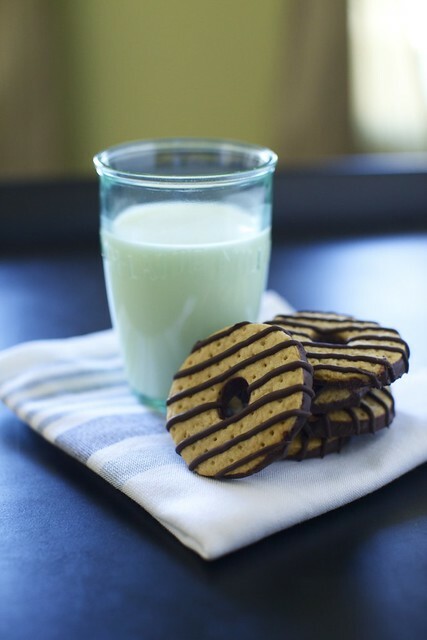 And fudge stripe cookies, which in particular remind me of my sweet amazing Grampa. Grampa and I were buddies. 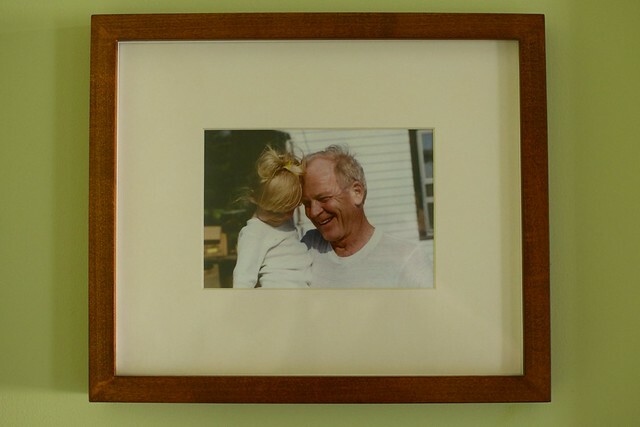 Even though he had eight grandchildren and loved us all to pieces, when we were together I felt as though I was the most important thing in his world. We played all sorts of games together. I loved to play doctor with him. He would be my patient and every time he said he was feeling better and start to stand up, I would push him back down on the couch and shout, “No you’re not!” (Great bedside manner – ha!) We went to the park together and he sang me “Back in the Saddle Again” while riding the teeter totter, only this was a customized version all about me, his little Annie. (I was devastated when as a teenager I learned that in fact, someone else had written this song and it was not really about me.) One of my very favorite things to do with Grampa was have what we called “chats”. Our chats were really more like interviews where he would ask me about something, and I would tell him everything I knew on the subject. I loved being at the center of his attention. Often we would enjoy the packaged fudge stripe cookies during our chats, and forever after I would come to associate these cookies with Grampa. It’s been years since I’ve eaten one of these cookies but the moment I saw this recipe for a homemade version, I knew I had to try them. They were quite simple to make and the results made me feel all kinds of nostalgic. You end up with a crisp, fine textured cookie that is strikingly similar to the original but better. I used dark chocolate this time around because that is what I had on hand but I think semi-sweet would be closer to the store bought version. I’m so happy to be able to make these at home with surprisingly few ingredients, all of them pronounceable. 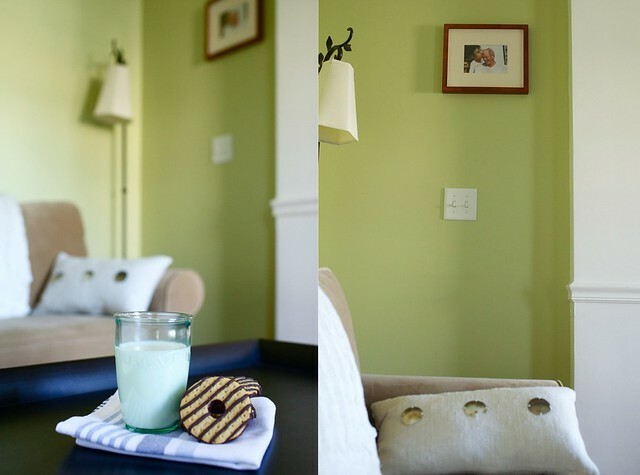 I decided to photograph these cookies in one of my favorite places in our home, our front living room. It is the place I love to sit and read, reflect, maybe enjoy a warm drink. But the main reason I love it so much is the picture on the wall. This is my very favorite picture of Grampa. I wish he was here to try my version of these cookies but instead I’ll just enjoy them for the both of us. *To make the needed amount of clarified butter, melt 12 tbsp. butter in a saucepan over medium-low heat. Skim all of the foam from the surface. Measure out the liquid portion (½ cup by volume or 3 oz. by weight), leaving behind any solids that have settled to the bottom. **For best results, use tempered chocolate for the coating. This gives the chocolate the best texture, makes it less likely to melt when held, and allows the cookies to be stored at room temperature without the chocolate blooming. If you don’t want to bother with tempering the chocolate, just store the cookies in the refrigerator. Preheat the oven to 350˚ F. Line baking sheets with parchment paper or silicone baking mats. Combine the flour and baking soda in the bowl of an electric mixer and stir briefly on low speed to combine. Add in the corn syrup, butter, and vanilla, and mix until a dough comes together. Form into a disc, wrap in plastic wrap and chill for 10-15 minutes. Place the dough on a lightly floured surface and roll out to ¼-inch thickness. Use a 2½-inch round cookie cutter to cut out rounds of dough, and use any smaller cutter or pastry tip to cut a small hole from the center. Reroll dough scraps and cut out additional cookies. Place the dough rounds on the prepared baking sheets and poke lightly with the tines of a fork. Bake until just barely browned, about 7-9 minutes. Transfer the cookies to a wire rack and let cool completely. When the cookies are completely cool, melt the chocolate in a heatproof bowl set over a few inches of simmering water. Line the baking sheets with new pieces of parchment (or flip over the pieces you already used). One at a time, dip the bottom of each cookie lightly in the melted chocolate so that it is covered with a thin layer. Transfer to the baking sheet and repeat with the remaining cookies. 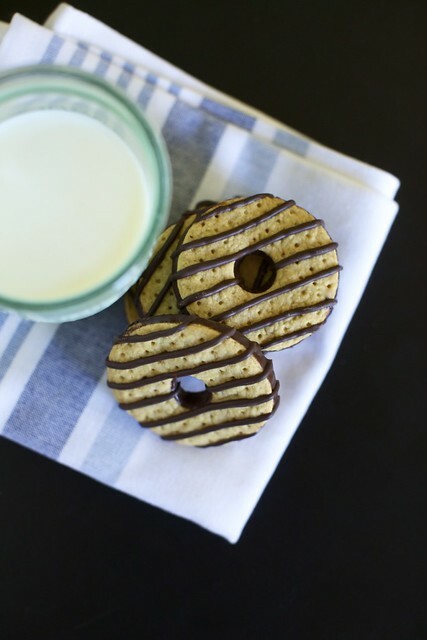 Use the remaining chocolate to create a striped pattern over the surface of the cookies (use a squeeze bottle or a plastic bag with a very tiny tip cut off). If you are using tempered chocolate, simply let stand at room temperature to allow the chocolate to harden, about 5-10 minutes. If you are using non-tempered chocolate, transfer to the refrigerator to chill briefly and set the chocolate. Store in an airtight container.